There are very few things as important to your home as your front door. It’s one of the first things your guests see when visiting. It’s a reflection of your style and personality. And, perhaps most importantly, the right entryway keeps your family safe and comfortable inside. But even the best doors are only as good as their installation. That’s why Door Store and Windows takes the time to install your product correctly the first time so you don’t have to wonder if another replacement is just around the corner. You’re probably curious about the installation process and how much time it will take. Our number one priority is customer satisfaction and 100% transparency with our customers. We are proud to say that most of our door installation projects take one day to complete. 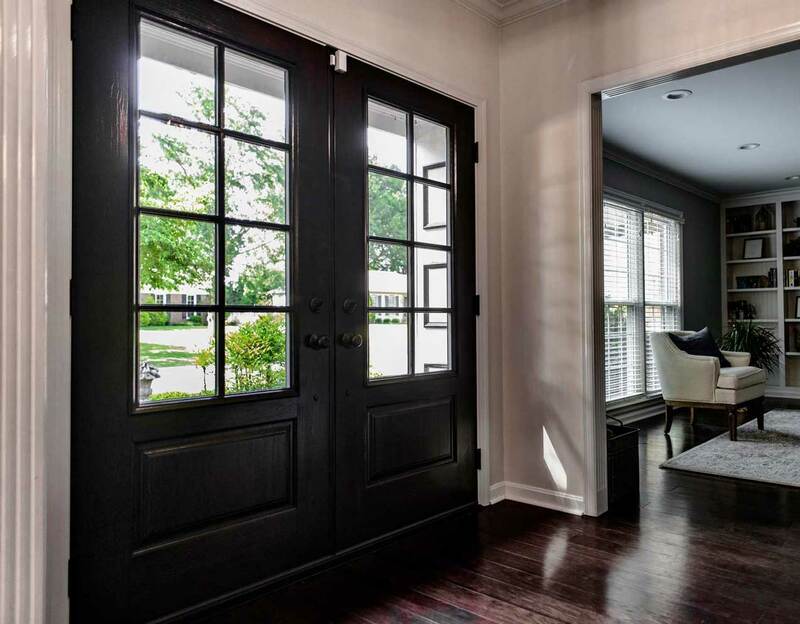 We strive to cause as little disruption as possible, leaving your home just the way we found it – with the exception of a fabulous new entryway! Our door installation team consists of one to three people. When the team arrives they will introduce themselves and get to work prepping the work space. 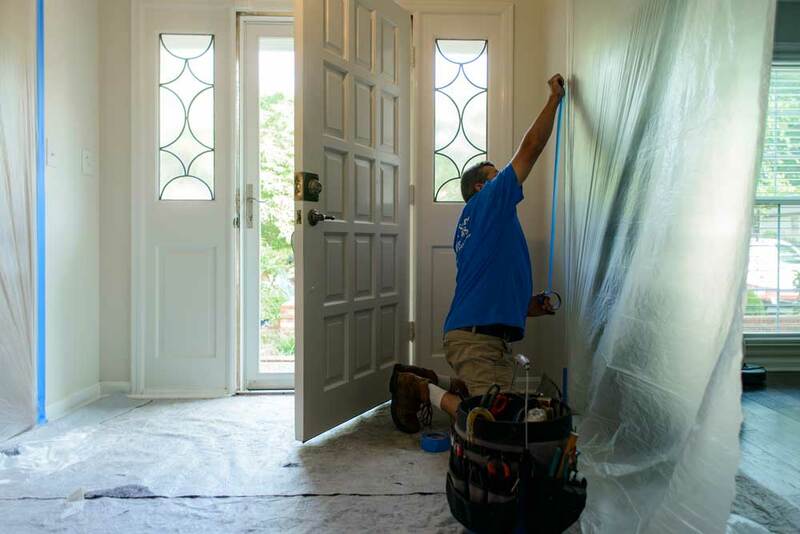 Plastic sheeting is placed on the floor and surrounding surfaces to contain debris and protect surfaces. Additional coverage is used for lead-safety projects to contain lead dust. Before removing your old door, our team takes the time to re-measure the insert area and the new door. This guarantees that the product delivered is the right size and we are able to complete the project once we remove the old door. After measurements are verified, our team carefully removes the old door. This job takes precision in order to preserve the original door molding and surrounding areas. Before installing your new product, the old door and frame are carefully removed. It can be a bit shocking to see such a large opening in your home. Our team works quickly and efficiently to install your new product the same day. 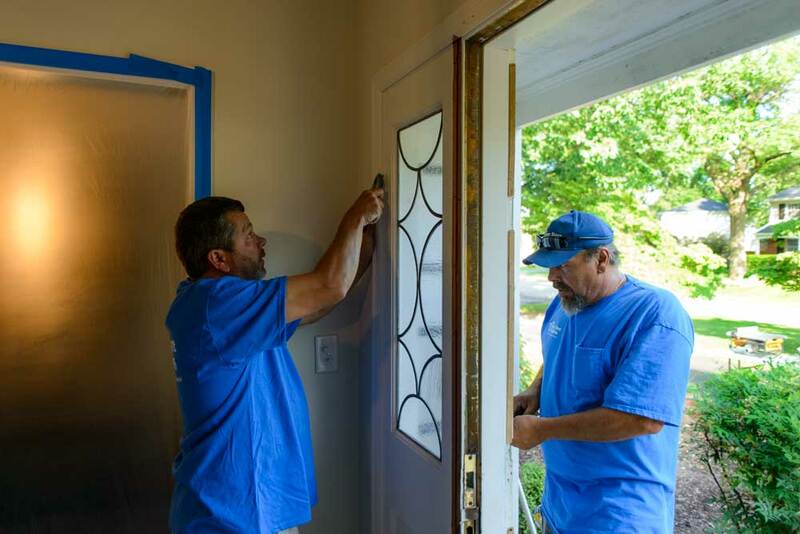 Once the old door is removed, our team cleans up any loose paint, dust and other debris from the insert area. At this point in the demolition, you will be able to see inside your wall! This surprises some of our customers, but not to worry. Our team will seamlessly install your new product – no leftover signs of demo in sight. 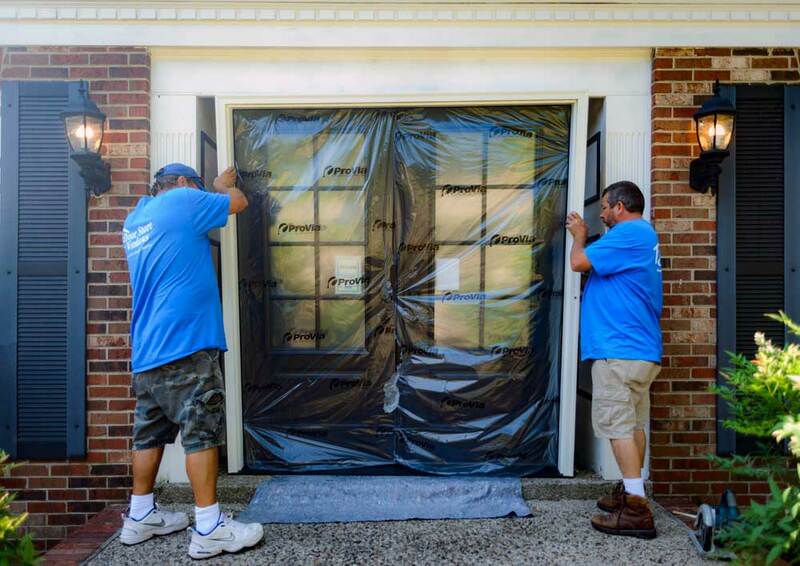 Our team carefully unloads the new door, removes packaging and installs the product. Once the door is set and secured to ensure the unit is plumb, level and square, we use spray foam insulation around the perimeter of the door. This creates an energy efficient seal. Then, we reapply the trim. After installation we clean up any debris, vacuum the area and remove the plastic sheeting. We work to ensure your home is left just the way we found it, but with a fabulous new door! Our goal is to provide peace of mind and customer satisfaction throughout the entire buying process. 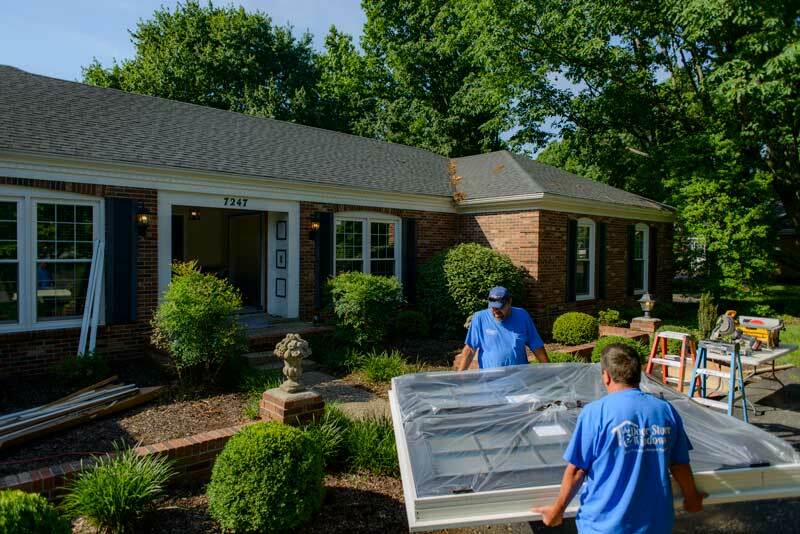 Click here to learn more about the entire Door Store and Windows Customer Buying Process or if you have any questions, feel free to give us a call at (502) 822-5424.